You have arrived at ONCE UPON A TIME, your enchantingly romantic Smoky Mountain escape only MINUTES FROM DOWNTOWN GATLINBURG. We have paid careful attention to your comfort, relaxation and enjoyment. There is a plush king size bed in the loft bedroom along with a relaxing jetted tub. Daydream as you relax in the private and romantic hot tub while enjoying the panoramic views of Mt. LeConte. Cuddle with the ones you love as you enjoy the beautiful stacked stone fireplace on the chilly Smoky Mountain winter nights. You will also find a fully equipped kitchen, a charcoal grill just outside your door and a washer and dryer for your convenience. You may also enjoy playing pool on the full size pool table in the great room. For the small family, you will also have a futon and pull out sleeper, which will accommodate 5 people. At ONCE UPON A TIME, you will get away from it all while enjoying all the comforts of home and then some. Relax with your morning coffee while taking in the splendor of the mountain and the beauty of nature that surrounds you. You may also enjoy a stroll down to the clear mountain lake you will pass on the way to your cabin. 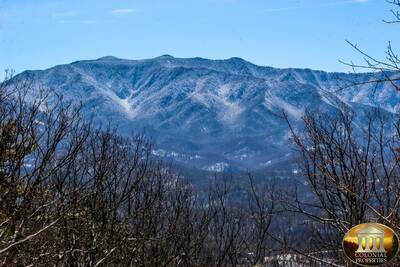 Let ONCE UPON A TIME turn your dream into reality with special memories, forever reminding you to keep coming back to YOUR special place in the Great Smoky Mountains. A: Hi Rogelio! Once Upon a Time is not a pet friendly property. We do have other properties on the program that are. A: Hi Brandy! Yes, this cabin has a shower in the full bath. “ Had a wonderful time,will definitely be back. “ Loved it. My wife and I are already planning a return trip for next year. Beautiful view. Excellent amenities. Can't wait to go back. “ The cabin was awesome. I only wished for 2 rocking chairs on the deck. The views were awesome and very quite and easy to get to. 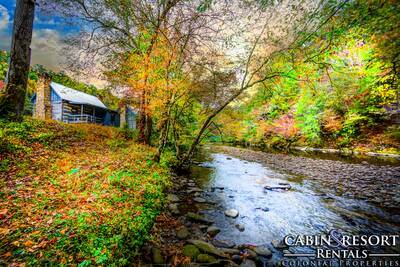 “ Just a wonderful cabin with a fantastic view of Mount LeConte. It was quiet and felt secluded from other cabins and houses. We really enjoyed the location, in the arts district with a really nice bistro very close by. 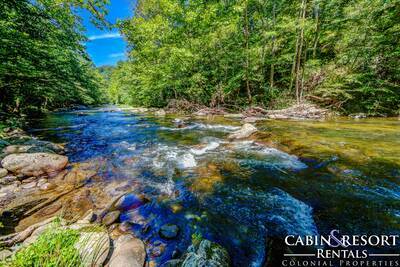 It was rather close to the Greenbrier area of the park, which is so very beautiful. Had a great time there. “ Beautiful cabin. Very spacious, clean and comfortable. We had a spectacular view from the private balcony, especially while relaxing in the hot tub! “ This was an amazing cabin. The view of the Smoky mountains never disappointed me. A new experience were the sounds of the birds in the morning and the symphony of the crickets and bugs at night. It was our first time seeing a bear and it was scary awesome. 10 mins away from town. Our first time renting a cabin and we will definitely be doing it again through this company.